Applications are being offered from Federal Insurance Ombudsman Secretariat Pakistan Jobs 2019 Latest. For all those applicants who are searching the Govt jobs so currently, Federal Insurance Ombudsman Secretariat Pakistan is seeking to hire the well disciplined, calibre and adroit applicants are required to apply for the following posts given below. 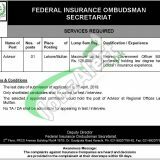 Jobs in Federal Insurance Ombudsman are such as (Advisor) is the post which needs to be filled with the overall qualification of LLB is required especially those as Retired Government Officers of BS-21 are required to apply. Handsome salary packages are offered to the applicants. Now, I will let you know about its further details below. In Pakistan there are number of the Ombudsman and out of them one in Federal Insurance Ombudsman Secretariat Pakistan is the Federal Govt body which is regulated by the Govt of Pakistan and is this is responsible for the issues related to insurance are dealt by this. Being a Govt department it offers Govt jobs of different level. Applicants are required to send the application along with its credentials should reach the said address. So, for more jobs stay connected with this page for such posts. Address: Deputy Director, Federal Insurance Company Ombudsman Secretariat Pakistan, 2nd Floor PRCS, Annexe Building, Plot number 197/5, Doctor Daudpota Road, Karachi.